Atomos Shogun review and comparison. Mike Sutton, Story & Heart Community member and go-to guy for technology and filmmaking gear insight, shares his thoughts and experiences with the Atomos Shogun. Few filmmaking products are as talked about right now as much as the Atomos Shogun. It’s trending on gear blogs all over the web, and it seems that everywhere you find filmmakers, they’re geeking out on the fabled device. But as we all know, there’s a difference between product hype and product performance. A lot of reviewers gush about features but miss the boat when it comes to evaluating how a product holds up in the real world. For that perspective, we turn to a member of the Story & Heart Community to help us get beyond the hype and help filmmakers of all experience levels decide if the Shogun is right for them. This filmmaker is Mike Sutton, a cinematographer and high-speed specialist. With more than 20 years of industry experience, he has earned quite the reputation as a go-to guy for advising on technology and implementation for film, video and high-speed projects. He’s the perfect filmmaker to dig deep and tell us how the Shogun holds up across the board, as over the years, he has used almost every recorder on the market in a studio and in field environment. Since we know filmmakers of all backgrounds want to know about this device, Mike has separated his review into three sections, looking at the features a beginner, intermediate or professional filmmaker want to know all about. Let’s turn things over to Mike and see what he has to say about the Shogun. At the National Association of Broadcasters (NAB) 2014 show, one of the big highlights was the Atomos Shogun 4K recorder—mainly due to the announcement of the Panasonic GH4 and Sony A7s cameras, both of which are 4K capable. The Sony A7S has a small compact form factor, great lowlight and is mirror-less. However, the caveat to 4K on the A7S is that it’s only available through the HDMI out and not internally. Atomos was the first to address this shortcoming with the Shogun, the first 4K HDMI-capable recorder, which looked looked very promising. And knowing the typical price points of Atomos products, it was also safe to say the Shogun would be an affordable 4K recording solution. In late December of 2014 the Shogun was finally made available for purchase. My review on the Shogun is based on my own hands-on experience and real-world use. With all that said, let’s get down to the nitty-gritty. Let’s see how the Shogun holds up in the real world. I’ll get right to the point: filmmakers just starting out will love the Shogun’s pricing, packaging, ease of use and included accessories. It has all the connectors you need right now and down the line when you’re ready for more. 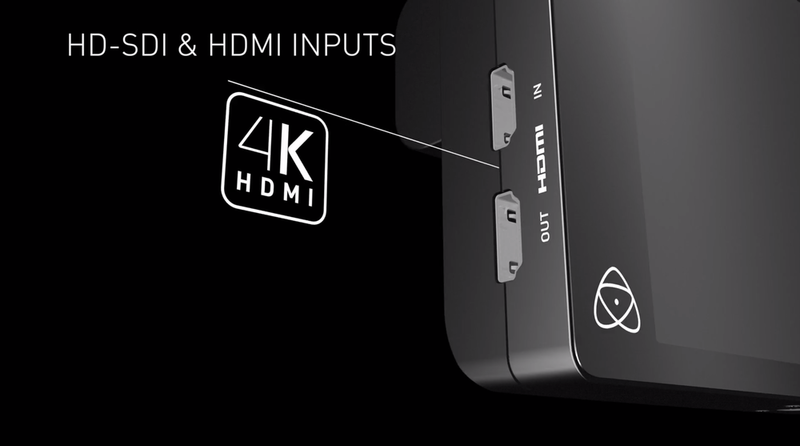 The Shogun will work with any clean feed HDMI output and is already 4K ready (UHD for now, 4K with future update). The monitor is big and bright, making it easy to see what your framing. Plus, the tools you need for exposure and focus are built in. Audio levels and focus assist are all a touch away, and audio levels are easy to adjust since there are visual meters confirming audio is present. The unit is lightweight, making it a good addition for DSLR filmmakers who might not have or want a bunch of bracketry—which would be required of a heavier recorder. You can mount the Shogun on a hot shoe without worry of it being overbearing. Plus, to top it all off, the Shogun also has a three-year warranty—with registration. That’s nearly unheard of for an electronic item. Your camera doesn’t even have a one-year warranty—in most cases they are 90 days to a year. At $1,995 the Shogun packs a lot of value for your money. Note: If you are a film student or member of the faculty you can get an incredible 25% off of the Shogun’s retail price. There are no hidden costs or required options to make the unit work out of the box outside of almost any off the shelf HDD or SSD—keeping in mind if you want to film in 4k, there are a limited number of SSDs you can use. The Shogun includes a hard case, battery, charger, AC adapter, powertap adapter, 5x master drive caddy’s, USB3.0 docking station and a lemo to XLR audio breakout cable. All with a 3 year warranty! There are no other systems that will offer all this at this price point. Like the Atomos Ninja Blade the Shogun is very simple to operate. The screen size is large, and the touch button placement is off of the image and well placed. Even without reading the manual it’s fairly clear how to navigate the menu. With the Shogun, Atomos gives you everything you would need just starting out. Even going so far as to give you a battery and AC options. Another smart move on their part as these little things add up and it’s normal to spend a few hundred dollars buying these items separately. The drive caddies use standard 2.5 HDD or SSD’s which are fairly inexpensive and easy to get. If you consider yourself a beginning filmmaker, you’ll love the Shogun. It’s simple to operate. It gives you all of the features you need right now, and the ones you’ll want later down the line. And it has plenty of included accessories too. But what if you’re an intermediate filmmaker? How would the Shogun work for you? Read on, and let’s find out. Filmmakers who are doing sporadic professional work mixed with personal projects will most likely choose the Shogun for the same reasons listed above. But you might be a bit more reserved about your choices in a recorder/monitor. You might also see some of the cons of the system as an annoyance, but not necessarily a deal-breaker. Plus, monitor tools like histograms, waveform, RGB parade are all added benefits for you to take advantage of. Unlike the Atomos Ninja Blade, the Shogun has a single battery mount. This will not be a big deal as a large Sony battery will easily power the unit for a few hours. Like previous Atomos products, the HDMI ports jut out of the left side of the Shogun. This puts them potentially in harms way. Also there isn’t any form of cable protection to prevent them from becoming unplugged or snapped off. For some, this will not be an issue, but for others who run-and-gun this could be a problem. HDMI on the Shogun is 4K, which is a huge plus. You can hook up almost any camera that has 4K HDMI output and start recording right away. The only other recorder that currently does this is the new Convergent Design Odyssey 7Q+. The HDMI and HD-SDI are both active and feature a bi-directional converter, so you’re covered with most sources. This will be a big advantage for intermediate filmmakers who are using cameras that have HD-SDI. These connectors are well placed in the back of the unit and face outwards where they will not be in the way. All of the HD-SDI ports on the Shogun are also 12G/6G capable, which may benefit you if, for example, you are using Black Magic Studio cameras. The system can use off the shelf 2.5 HDD or SSD’s, giving you a lot of options in a pinch if you need more storage. You can also buy media at almost any electronics shop, making it handy and inexpensive compared to proprietary media. There are pros and cons to proprietary media—as you may know—but the same can be said for off the shelf media depending on your needs and requirements. If you plan on doing any movement with your camera, do yourself a favor and use SSD’s. Many of the features that make the Shogun such an attractive option for beginners will also entice intermediate users. Some of the cons I discuss above could be an annoyance, but I bet they won’t be a deal breaker. For the price, this is an excellent unit for intermediate users. But, let’s say you’re a professional. Is the Shogun still a good fit? Keep reading below as I dig even deeper. Filmmakers doing professional work on a consistent basis will like a lot of what the Shogun has to offer at this price point, but the decision to purchase or rent this unit will ultimately depend on the type of shooting they do on a regular basis. If you are in a studio or an indoor location, for example, the Shogun will have more appeal to you than it will for someone shooting documentaries in the wild. I say this for several reasons—as I’ll discuss below—but primarily due to the physical design and layout of the Shogun. The Shogun comes UHD ready (3840 x 2160), but not true 4K as marketed. I am told there is a firmware update that will offer true 4096 x 2160 support for Canon C500, etc. The Shogun has vents on the top of the unit with wide openings that will not hold up in rain, snow or other moisture. If you film outdoors this is a serious consideration. I am not sure why a shroud or a redesign wasn’t done. The venting slots are rather large and span almost the entire top of the unit—you cannot simply block these vents, as the unit will overheat quickly, as it uses heat pipe technology to cool. There currently are no rain cover options for the Shogun to prevent moisture damage. Although Atomos says there are no fans in the Shogun, there is clearly a fan-like sound coming from the vents. This could be the screen’s electronics causing buzz or hum, but its certainly noticeable in a quiet room. Unlike most monitor/recorders, the Shogun’s screen is calibrated to SMPTE Rec 709, D65 white point, 100% gamut and 1920 x 1200 resolution. One thing I really liked is the optional Spyder calibrator from Datacolor that allows for quick and easy screen calibration (a computer is required to calibrate with the Spyder). This screen size is not standard, but, in this case, this is good since the GUI buttons take up the unused portion of the image. The viewing angle is great as this is an IPS touchscreen with 178 degrees of viewing. The touchscreen is fast and responsive—I've never needed to press anything twice. Canon C-Log is also present which is a plus. Tools available at the touch of a button are test pattern, false color, zebras, luma overlay, vectorscope, focus peaking, RBG parade, zoom and a full waveform—which can be placed full screen or partially with opacity adjustment. I would also mention markers, but it is unclear exactly what these markers are for due to lack of adjustability or notations. I was disappointed that I could not assign a marker of my choosing. The Shogun has 12/6G HD-SDI connectors with loop-thru, Lemo to XLR breakout and gunlock. These are great features to have on a recorder, and I was happy to see that the Shogun’s audio was pretty robust with both digital and analog inputs as well as fully balanced XLRs (and even phantom power!). There are several ways to power the Shogun. Unfortunately, Atomos took away a feature I loved which was dual battery mounts and hot swapping. The battery catch is ok, but I can see how the battery could potentially dislodge. I think it needs a better battery catch like the one found in the Pix 240i, though Luckily, the Shogun includes a PTap battery dummy so you can use your Anton Bauer or V-mount batteries with the system. And Atomos goes one step further and includes a DC input on the Shogun’s body. Both HD-SDI and HDMI feature bi-directionality so you can, for example, input HD-SDI and feed a HDMI output to a Paralinx transmitter. This is handy, but there is a limit in that you cannot change the frame-rate on output. For example, if you feed it 60p, you get 60p on output, which can have limitations with transmission gear or other monitors. This is just something to consider as you still may need an additional converter on location. Unlike Sound Devices Pix 240i or the Convergent Design Q7+, the Shogun is encased in plastic instead of metal—even the Ninja Blade had an aluminum frame. It’s clear that Atomos chose the plastic casing to keep the units costs down. But I still think having a metal frame would have helped with cooling and also allowed for a better vent system or heat displacement option. If you have ever held a Pix 240i, the Shogun will feel cheap. In fact, that was the first thing I noticed about the unit. The glass on the Shogun spans edge-to-edge and offers no protection or way of mounting any type of protective cage. Currently there are no cages, sunshields or protective shields for the unit, which means if you drop the Shogun, its display will certainly crack. Also, the plastic used on the unit is unfortunately much thinner than I had anticipated, and flexing of the frame is too easy since its very pliable. An aluminum cage would potentially resolve this problem, but with the many connecters on the sides and large venting on the top, the depth of the cage would need to be significant. The power button on the Shogun I own began sticking the very first day I used it—on the set of a TV show, no less. If the button is not pressed directly center and square on, the button sticks inside the unit. The drives for the Shogun are unfortunately placed on the right side of the unit. This is an issue if you plan on shooting with this monitor/recorder in a traditional location—left of camera. This means if you are using a cine arm or a LCD holder that you have to re-adjust to swap drives. Every second counts on set so that is a potential problem. In my opinion, drives should be on the top or left side of the unit for quick and convenient swapping. Among professionals, there are different viewpoints on off the shelf media versus proprietary media. There are pros and cons to both depending on what, how and where you shoot. Luckily, the media is hot swappable, but if you are recording you will lose your clip. There is mention of a RAID option for the Shogun, but at this time it is not yet available. This RAID option will not be for redundant recording, but for increasing speed so the unit can record higher frame rates. There is also a CFast adapter in the works, which will be a good alternative to SSD’s. Atomos has the following features slated for the Shogun as free upgrades: 10-bit HD ProRes 4:4:4, 3D LUTs, 12G-SDI 4K 50/60P, Sony FS700 RAW Decode as well as true 4K 4096 x 2160 support. Support for 4K RAW is planned for the second quarter of 2015 and will record as Cinema DNG from cameras like the Sony FS700 and Canon C500. The Sony FS7 will work with the Shogun via HDMI 4K video but not 4K RAW (via HD-SDI), and it is unclear if the FS7 will fall under the 4K RAW Q2 plans. Pros and cons of the primary recorder/monitors on the market. Been proven in the field on thousands of productions. Screen size is only 5” versus the Shoguns 7.1”. Proper aspect ratio adjustable guides versus unclear non-adjustable Shogun markers. No educational discount on Convergent but a 25% discount on Shogun for students and educational facilities. We’ve said this about cameras, but it’s true for all sorts of devices: perfect gear just doesn’t exist—this is all about trade-offs. So, in deciding if the Atomos Shogun is right for you, it really comes down to what features you need versus those you can live without. And, as Mike shows us in his in-depth review, this has a lot to do with what level you are at as a filmmaker. As Mike concludes, the Shogun will be most appealing for the beginner and intermediate filmmakers, but professionals—those primarily in an indoor setting—will also find a lot to love. Special thanks to Mike Sutton for sharing his review of the Atomos Shogun with us. You can follow Mike on Twitter at @mns1974 and Instagram at @frozenpros. To view his portfolio, visit FrozenProsperity.com. Images in this blog post courtesy of LensProToGo, Atomos, and B&H Photo Video. Have a question for Mike about the Shogun? Or, have you tried the Shogun yourself and have something to add? Share your thoughts and questions in the comments below. Making a feature-length film (free webinar).